Sharrows (pictured below) are newish road markings. 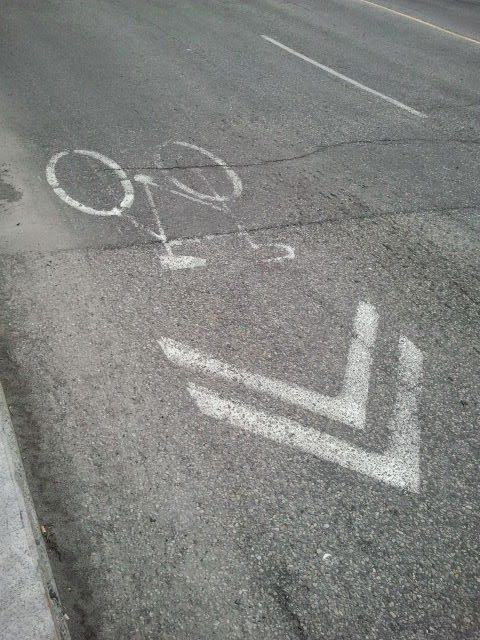 A bicycle stencil beneath double chevrons. They are meant to convey several messages to all road users. These messages can be broadly grouped under: "Bikes Belong"
Ottawa has gone sharrow mad painting them on all sorts or roads. The one pictured left was painted on the Bank St. bridge over Rideau River. I wrote about this bridge before, "Solution for scary bridges". That was almost two years ago, the no passing cyclists in the lane was abandoned in favour of sharrow lane markings. You can even see them in the satellite view on Google maps, pictured below. So the million dollar question: do they work? Do they influence the behaviour of motorists or cyclists? Are cyclists comforted, emboldened, welcomed to the street? Last time I wrote about this bridge I caught a couple crossing on the sidewalk. At the time I noted that they may have made this choice irrespective of road conditions. This is the most direct path to the Rideau River Eastern Pathway form the multi-use pathway through Windsor Park. Rationalizations aside this is sub-optimal behaviour. The sidewalk is narrow the railings are low, it is objectively dangerous. Yet, subjectively a comfortable, and therefore common, choice. Since that photo was taken, tragically a woman lost her life when a cement truck turned right on Riverside. A Ghost Bike has been installed on the South-West corner and a lot of hand wringing over how to make the bridge safer. Have the new lane markings changed the road environment? The photos above were taken yesterday, while I was out checking out the neighbourhood. It has been a bad year for flooding and the river is finally receding. 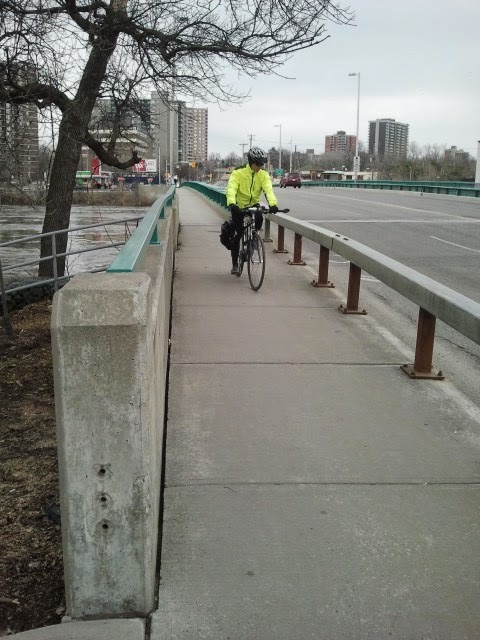 The still incomplete Rideau River Western Pathway is still mostly under water and I was checking out the Bank Street underpass, flooded and currently impassable. When I noticed several cyclists crossing the bridge on the sidewalk. I managed to catch these two but missed several others. I did witness cyclists on the road, but in my small sample it was about 5:1 on the sidewalk. I am not about shaming cyclists, people make choices based on the information available to them. Sticking to the sidewalk to cross on the "wrong" side to save a road crossing. I can understand that. It may be silly and selfish, but understandable. People, in the aggregate, are lazy and saving a few meters is worth a fair amount of risk. That said, all the cyclists I witnessed today were crossing with traffic and continuing north on Bank St. Everyone taking to the road after Riverdale Ave. No effort saving here. Objectively the cyclists would be safer on the road, and subjectively the sharrows should have, if they work at all, made the road more comfortable. People demonstrate their comfort by their actions. sharrows have not made Bank St. bridge more comfortable for cyclists. Maybe it's time for more concrete solutions. 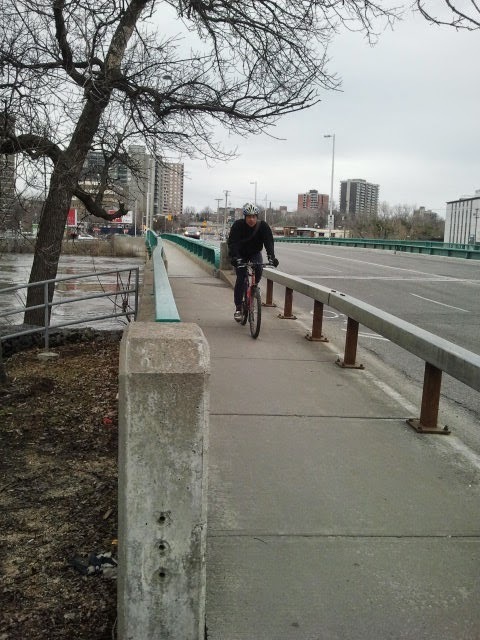 There is also no connection from the road (Bank street) to the Rideau River Western Pathway. No curb-cuts on either side of the street. So even if cyclists on the path wanted to ride on the road, the city makes the transition hard.